The Wrestling Firebirds displayed grit and toughness in a true team effort to take down rival Centerville in the annual Battle of Far Hills match, 37-19 The win enables the Firebirds to keep the Rt. 48 sign for another year. This year’s team becomes the first Fairmont team to keep the sign for consecutive years! The Wrestling Firebirds lost the County Line rivalry match to Beavercreek on 1/3/19 by the score of 42-25. Wins for the Firebirds came from Noah Maas, Gavin Fogel, Evan Overholser, Nevan Snodgrass, and Elijah Woodroof. The Firebirds are in action again next Wednesday when they host the Battle of Far Hills match at Trent Arena. Coed Varsity Wrestling · Dec 31 GAVIN FOGEL – DDN ATHLETE OF THE WEEK! 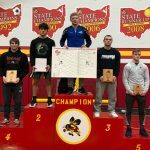 Coed Varsity Wrestling · Dec 31 SNODGRASS 3RD AT BRECKSVILLE HOLIDAY TOURNAMENT! 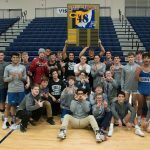 Coed Varsity Wrestling · Dec 21 FIREBIRDS WIN A PAIR!